Don't you hate it when a goofy little dude with bunny ears causes your pizza to be cold and otherwise ruined before it can be delivered? Hey, who doesn't!? As made famous by the Domino's Pizza commercials in which we were all advised to "Avoid the Noid", this lovable little deviant in the red rubber suit somehow ended up with his own Nintendo game too. 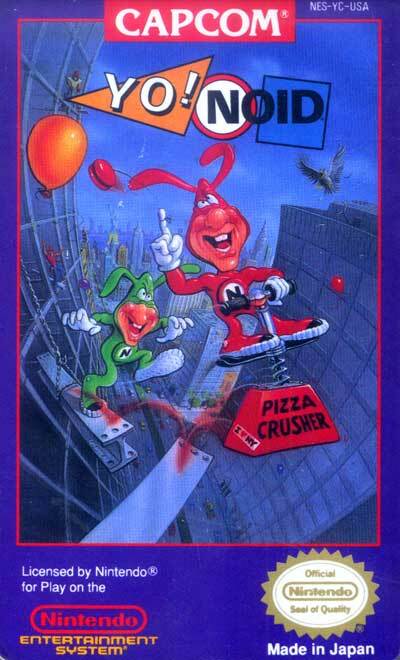 Of course, this wasn't actually designed to be a "Noid" game. It's a port of a Famicom title about a ninja (Kamen no Ninja Hamaru) which has had it's sprites swapped out. Obviously, being that the Noid is the protagonist of this game, it will be impossible for you to avoid him... we can only assume that he is up to good here, as opposed to his regular pizza-ruining antics. You're equipped with a short range yo-yo for offense and can gather magic scrolls for screen-clearing special attacks. Be careful not to touch any enemies, as this will result in instant-death - there is no life bar. As opposed to fighting bosses, at the end of most levels you'll face the local champion in a pizza eating contest. The back cover of the instruction manual included a $1 off Domino's Pizza coupon, although it's probably waaaay expired by now.